Sauteed Scallops over a Warm Roasted Bell Peppers Salad. Yeah……Spring Break is finally here!!! Yeah!!! Here in South Carolina, we are all ready and are all waiting with anticipation for Spring Break. And like many Americans I will be going away for a restful vacation my self. But as many of you know, going away also means getting ready for this trip. This means that all the little businesses need to be attended, laundry needs to be cleaned, suitcases need to be packed and tax needs to be filed ( YUK!!!). It is one thing to pack, but to get everything done before leaving is a tantalizing tasks especially when you are working a full time job like me. So guess what … I have to cut corners somewhere to find that extra time. And this was done tonite with dinner.. I ordered pizzas for my husband and my children, and I prepared myself very quick meal with what I had on hand: scallops in the freezer, and a few roasted bell peppers in my fridge. 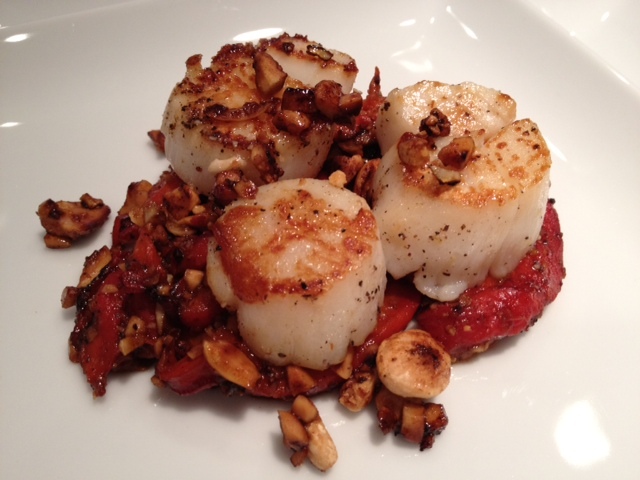 Ingredients for 1 : 3-4 scallops, 1 bell pepper roasted, peeled, and sliced in small strips, 1 garlic clove, 2 tbsp of Marcona almonds broken coarsely, 1/4 cup of balsamic vinegar, 1 tbsp of hazelnut oil, salt and pepper to taste. In a small frying pan, warm up 1 tsp of hazelnut oil. When the oil is sizzling, add the scallops ( fresh or thawed), and cooked them for 2 minutes on each side or until the sides is turning a golden brown. Remove the scallops from the frying pan, place them on a warm plate, and cover them with some aluminium foil to keep them war. In the same frying pan, add 1 tsp of hazelnut oil and add the red pepper strips. Saute them for a few minutes, add the chopped garlic, broken Marcona almond and saute it all for a few minutes. Add the 1/4 cup of balsamic vinegar, salt and pepper and bring it to boil. Let it simmer for a few minutes. To serve, spoon the red pepper salad on a plate and place the scallops on top. Drizzle some more of the vinegar over the scallops and spoon a few of the marconas pieces. Et voila!! !